But Santa, It's Only September! Just when I’m finally caught up with our Halloween candy, along comes the candy canes. It seems to get earlier and earlier every year. As you can tell by our employee’s faces, they were about as happy as I was today to see the tractor trailers lined up waiting to unload Santa’s favorites. You want to talk about “No room at the Inn”. Floor to ceiling boxes of all sizes, shapes, colors and flavors of candy canes. I saw the traditional red and white, and those funky designer gourmet tasting ones and those Giant candy canes as well. Blueberry, Strawberry, Hot Cinnamon and even Sugar Free. As I was peaking around the corner to make sure my eyes weren’t playing tricks on me, I even saw tootsie candy cane lollipops sheesh. Fall has officially arrived and when people get into the Fall mood, it normally brings the wanting of cooler temps, colorful leaves, Halloween Candy, and Football. While I was searching through some pictures on my computer trying to find a picture for my Halloween costume idea, I ran across this picture. This is Joe, Blair Candy’s first official King of Candy. 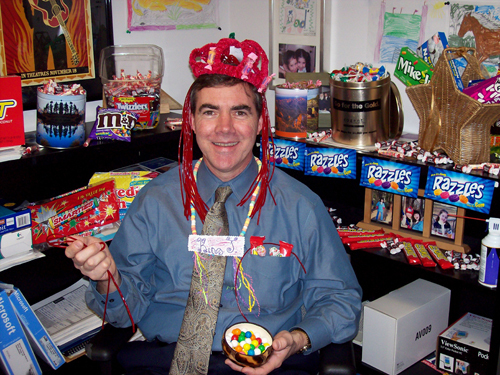 His co-workers entered him in this contest we had a while back looking for the king or queen of candy. They wrote us stories about him and how walking in his office was like going trick or treating. You line up at his door, he gives you candy. Needless to say, Joe won our contest! He received $500 worth of free candy. Joe was so sweet, he donated most of it to a children’s hospital in the DC area. Joe’s picture and his stories from his co-workers had us all in stitches here laughing. Little does he know he just saved me a few bucks. I’m going to make my Halloween costume out of the materials I work around daily. For almost 70 sweet years we have been selling candy to everyone. Our shelves may not be able to really talk, but our years of filling them can! It started way back in the 30’s when my grandfather started our wholesale candy business. Twenty five years later my father was in charge of the same shelves and needed to add more shelves for the Bubble Gum Cigars, Candy Necklaces, Atomic Fireballs, Shoe String Licorice and Marshmallow Peeps. Forty years later when the 3rd generation including myself took over, our shelves were still filled with all the above plus much more. My generation needed even more shelves for the Skittles, Gummi Bears, Worms and Penguins, Blo Pops, Caramel Apple Pops and all the new dark chocolate confections. A 70 year time line of watching the shelves load and unload of thousands of different candy treats makes us pretty experienced and our shelves pretty important. 70 years of housing and selling thousands and thousands of different sweet candy treats, watching them load onto the shelves, watching them go off. Watching the chocolate’s turn colors, the hard candy go chewy and the sweet candy change to sour. 70 years of distributing it all to the retail stores to sell or to the individuals who shop our brick and mortar stores, or our online store. Just what would our shelves say if they could talk? Plain and simple, short and sweet; Nobody Knows Candy Like We Do! With only 43 days left till Halloween I sit at my desk staring at all the Halloween candy we carry wondering who’s going to take the ghosts and goblins treats back to green this spooky season. Halloween is my favorite time of the year, the memories of shopping with my mom to get my boxed Halloween costume that came with the mask that made my face sweat all night and watching the piles of candy and fruit I would see filling my pillowcase as I went door to door. Ahh such sweet memories! My favorite treats back then were the regular size Snicker bar, and those bags of M&M’s that seemed to last all night. Now it’s the mini snack size candy bars that get all the attention along with gummy earth worms, gross candy body parts, or those skull shaped lollipops that turn your tongue purple. What happened to the nostalgic candy treats like smarties, pixy stix and jawbreakers? Now it looks like this years “Green” version of the real apple treat is apple flavored candy warts. A far cry from the real apples I use to get in my pillowcase! It will be interesting to see if the natural popcorn balls and the real fruit once again begin to fill up those blinking plastic pumpkins and those designer treat bags this season. As a kid, nothing was more disappointing than to run up the sidewalk to the biggest house on the block, stand in line at the door till they guessed me and be handed a real apple, ugh! Not that I was ungrateful, but being born into a family that owned the largest wholesale candy company in Pennsylvania, this was my chance to get a bag full! For some reason back then we never had any candy at home. After sitting behind this desk for the past 28 years, surrounded by even more candy choices than when my father owned the company,I now understand… it’s the last thing you want to take home! Like my parents cupboards were when I was young, I find mine at home minus the candy, but filled with the salty snacks like chips, pretzels and peanuts. I now understand the meaning of the old cliche “don’t bring your work home” LOL. I wonder if the person who came up with that cliche owned a candy company like we have the past 70 years?